As per IDC’s Quarterly mobile phone tracker, the Indian smartphone market has shipped 142.3 million units in 2018, registering a healthy 14.5% year-on-year (YoY) growth as compared to 2017. Though the Q3 2018 has been the strongest quarter, the market saw a sequential decline of 15.1% in Q4 2018 owing to high channel inventory. The healthy annual growth of 19.5% was driven primarily by multiple sales by e-tailers beyond the festive Diwali period lasting into December. However, the offline channel had a muted year with a modest 6.7% annual growth in 2018 and growing 5% sequentially in Q4 2018. With the government initiative to push local manufacturing in India, 2018 witnessed further duty hikes on mobile phone components, coupled with weakened rupee further added to the challenges of the long tail of brands outside the Top 5. The overall smartphone average selling price remained flat in 2018 at Rs. 11,000 approx, with high shipments in the mass segment of Rs. 7,000 to Rs. 14,000, it accounted for more than half of the smartphone market in India. 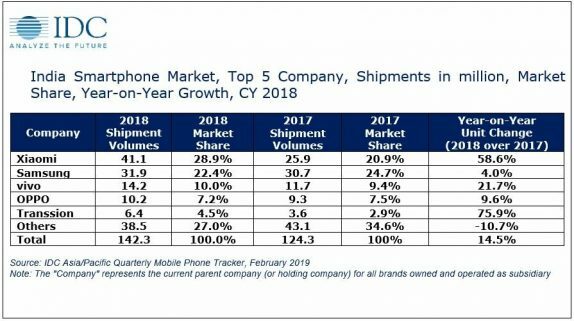 The feature phone market, which makes up 56.0% of the total mobile phone market clocked 181.3 million-unit shipments in 2018, with 10.6% YoY growth. This was primarily driven by Jio Phone shipments through the year, which contributed 36.1% of overall feature phone shipments. The 2G/2.5G market declined by 23.0% YoY in 2018 owing to high demand for 4G enabled feature phones in the market. Xiaomi continued to dominate the market with a 28.6% YoY growth in Q4 2018. The Xiaomi’s Redmi 5A and Redmi Note 5/Pro series emerged as the fastest selling devices of 2018 driving 10 million shipments each in the entire year. The brand continued to lead in the online channel with a share of 47.2%, climbing to the second slot in the offline channel by surpassing Vivo in Q4 2018. 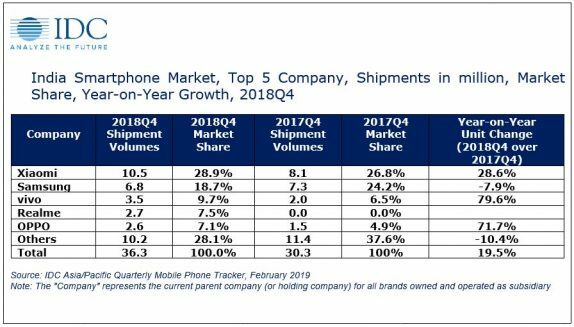 Samsung remained in the second position but has witnessed a YoY decline of 7.9% in Q4 2018. The newly-launched Galaxy A7 (2018) with triple cameras picked up demand followed by its Android Go model, the Galaxy J2 Core. Vivo continued at 3rd position with high YoY growth of 79.6% in Q4 2018. Its affordable models; the Y81 and Y71 – continued to generate maximum demand along with the flagship range of V11 and V11 Pro series. 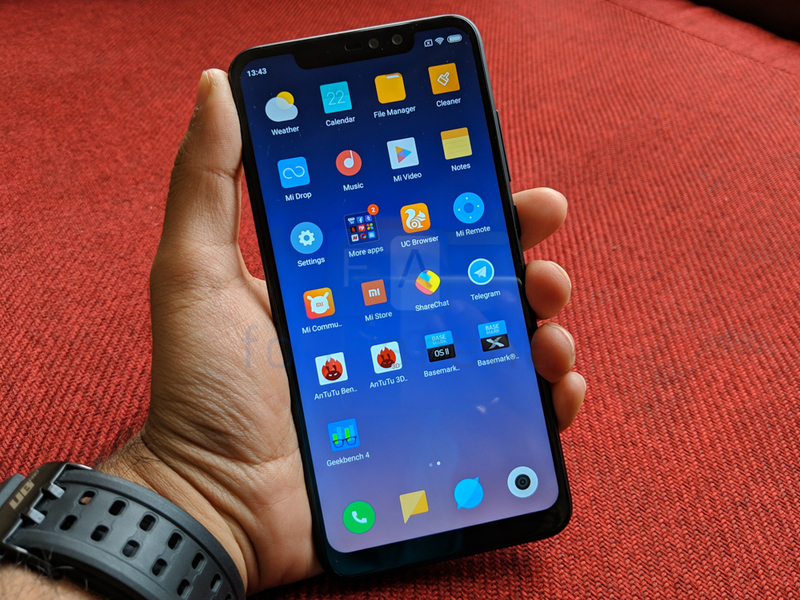 Surprisingly, Realme has entered the top 5 at the 4th position thanks to its aggressively priced Realme 2 and Realme 2 Pro series. It has generated a market share of 17.3% in Q4 2018. The brand plans to extend its footprint into offline channel initially through Large Format Retail Stores like Reliance Digital and gradually scale up to traditional brick and mortar stores. OPPO continued at 5th position, with high YoY growth of 71.7% in Q4 2018. The brand’s “A series” with models like the A3s and A83 generated middling demand.